There were 26 press releases posted in the last 24 hours and 153,142 in the last 365 days. Vickie Paladino, center, surrounded by Personhood New York and supporters. 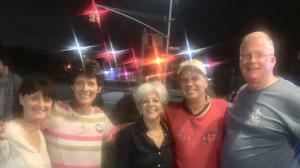 QUEENS, NEW YORK, USA, November 2, 2018 /EINPresswire.com/ -- Personhood New York is proud to say they have their very first Personhood approved NY State candidate in Vickie Paladino! After only a few years in existence, Personhood New York can say, we did it! However, this could never be accomplished without giving most of the credit to the woman whose got a lot of punch! Vickie Paladino, born and raised in Queens New York who owned her own business for many years, never planned on running for office until last year. When NYC Mayor de Blasio left the United States after a woman NYPD officer was ambushed and killed because of her uniform, Deblasio left the country to attended a conference in Germany, to talk down America to foreign nations, while NYPD was mourning a loss of their one of their own finest. Soon after, Paladino took on de Blasio with an unplanned happenstance on a Queens street, all caught on media. She expressed her disgust to de Blasio as he skirted away from Paladino. After news spread through out the media and NYPD, Vickie received countless phone calls of thanks and praise, including the talk radio personality Mark Levin who called Vickie a “great Citizen”. The idea of running for office was born and Vickie was off blazing the trail as a Republican, on the conservative side. Vickie Paladino won the Republican Primary on September 13th, for New York State Senate, Queens District 11. She is on the ballot this Tuesday , November 6th, 2018. 100% grade on Personhood’s survey and for her fearless, committed position throughout her tough campaign. She displayed the tenacity and moral values we so desperately need in New York State. Vickie Paladino is our Star candidate, and she will be a strong voice for the Personhood mission in New York State. We believe she will lead those legislators who sit on the fence towards a pro-life vote because of her leadership. She is our game changer! She is the answer to our prayers!